On Friday, the city took another step down the long path toward reconciliation by announcing that a portion of the road that links Edmonton with the Enoch Cree First Nation will soon have a Cree name. Mayor Don Iveson promised two years ago that the city would work hard to repair relations with its First Nations citizens and neighbours, and to recognize and celebrate its centuries of aboriginal history. Dignitaries gathered at City Hall to announce that 23rd Avenue between 215 Street and Anthony Henday Drive will be renamed Maskekosihk Trail. The Cree word generally means "people of the land of medicine" and is pronounced Muss-Kay-Go-See. Enoch First Nation Chief Billy Morin said the renaming has great significance for his people as part of the reconciliation process. "We have to reconcile with our own communities and with ourselves as people," Morin said. "And the way we're going to do that is through our culture and identity. When we look back in 20 years — and my son, our kids, our grandkids drive on that road — that's where it all started, that's when reconciliation started within ourselves and with the general public. So that's why it's big today." The new road sign will have the name in both English and Cree, which Morin said is also very important. "It's the culture and the language that comes out and makes us powerful as people," he said. "When it's heard, it's seen. That's what just brings it out for us as people and instills pride." At the Truth and Reconciliation hearings in March 2014, Iveson proclaimed an entire year of reconciliation in Edmonton. "We must make ongoing and concerted efforts to remember residential schools, bear witness to the truth and begin a shared journey of reconciliation," the mayor said at the time. to create a public space in the city for indigenous ceremonies and cultural programs. Two months ago, city council voted to spend $400,000 to help build that cultural and ceremonial space, and to fund a number of other aboriginal projects. 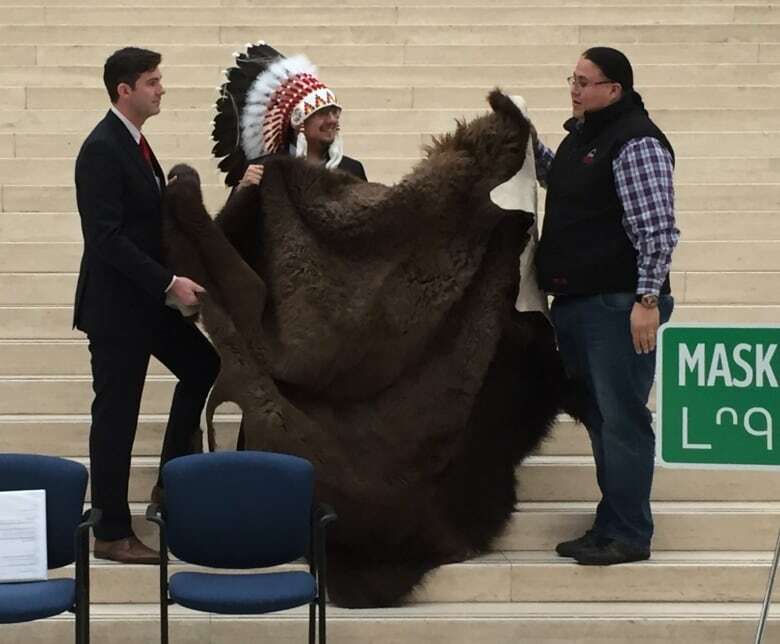 As a lifelong proud Edmontonian, Morin said Friday he is glad to see the city following the example set by Calgary, which has many roads with First Nations and indigenous names, including the Shaganappi and Crowchild Trails. "Finally, Edmonton strikes back, he said. "I'd like for (Edmontonians) to embrace that culture and that language and that partnership." Morin said he found it a little surprising that it took Edmonton so long to take such concrete action, but said it's never too late and he's glad it's happening now. The renaming will not end with one road, Iveson said. He expects other facilities and roads to take on indigenous names, one example being the new bridge for the Valley Line LRT. "There's a lot of symbolism to this," the mayor said. "But the most important one is a gesture of friendship and reconciliation from the city of Edmonton."